As a former member of both the Boy Scouts of America and the Church of Jesus Christ of Latter-day Saints, I support the founding principles of both organizations. My life has been greatly enriched and blessed by both memberships. 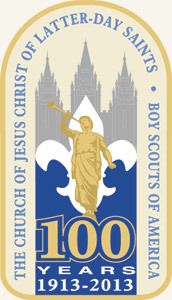 I’m very grateful for the LDS/BSA relationship, which has spanned over 100 years. In fact, the LDS church was the BSA’s first chartered organization and set the pattern for all the other sponsoring organizations that came thereafter. Sadly, much has changed since my youth, and today the BSA is an organization in decline, having lost over 50% of its youth membership since 2000. As the BSA struggles for its very existence, the BSA/LDS relationship is increasingly crucial to the survival of the Boy Scouts of America. In a nutshell, the BSA depends on the LDS church. That shouldn’t come as any surprise, as 51% of all scout troops sponsored by a religious organization are sponsored by the LDS church. When you take all units of any sponsorship into consideration, the LDS church still sponsors 37% of all troops in America. Losing the LDS church would therefore, instantly, cost the BSA over a third of its remaining scout units. That’s a big hit to take, and there’s a lot on the line, as the BSA has over $1 Billion in assets to protect, and an annual budget of over $200 million. A few years back, I moved into a new ward, and my first calling was to head up the Friends of Scouting drive. My ward’s required donation to the BSA was $5,000, on top of membership dues for each boy and chartering fees. There are nearly 40,000 LDS scout troops. Of course, they may not all have such sizable donation requirements, but any way you do the math, the LDS church means big numbers and big money for the Boy Scouts. Similarly, the LDS church depends on the BSA, as scouting is the official young men’s program of the church, and most young men’s activities, particularly for ages 12-14, are centered around scouting. So in 2013, when the BSA came under intense pressure to accept openly gay scouts, this presented a vexing difficulty for the leadership of both the BSA and the LDS church. Threats of funding loss and boycotts, as well as the removal of corporate sponsorships threatened the future of the BSA. The support of the LDS church was absolutely essential, yet questionable, due to the LDS stance homosexuality. If the LDS church could not be convinced to accept openly gay scouts, the BSA would face its imminent demise. As you may recall, the BSA deliberated the policy change for several months. Undoubtedly these deliberations included the LDS church and President Monson personally, as he is the longest-tenured member of scouting’s National Executive Board (serving for 46 years.) This board ultimately voted to approve the admission of openly gay scouts. On May 23, 2013, the BSA's National Council approved a resolution to remove the restriction denying membership to youth on the basis of sexual orientation. The same day, the LDS church released a statement in favor of the new policy. Disaster, it seemed, had been averted. But how did the BSA win the church’s approval for such a public reversal of position? Let’s look at what happened after the decision was settled. In conjunction with the 2013 National Boy Scout Jamboree, the new Thomas S. Monson Award was announced, allowing LDS and non-LDS scouts and leaders to earn the right to wear President Monson’s face, in full color, on their uniforms. I find it particularly odd that non-Mormon scouts and leaders nationwide would be encouraged at the National Jamboree to learn about the Mormon Prophet's life so they could wear his face. But I suppose it’s no more odd than the fact that the Mormon Prophet would allow people to wear his likeness as an award. This stage production at the LDS conference center celebrated, with much fanfare, the 100-year relationship between the BSA and the LDS church. Just before the program, Thomas Monson was awarded Scouting’s Medal of Honor for saving a life when he was 12—which was announced at the program during a 20-minute segment devoted solely to honoring President Monson. 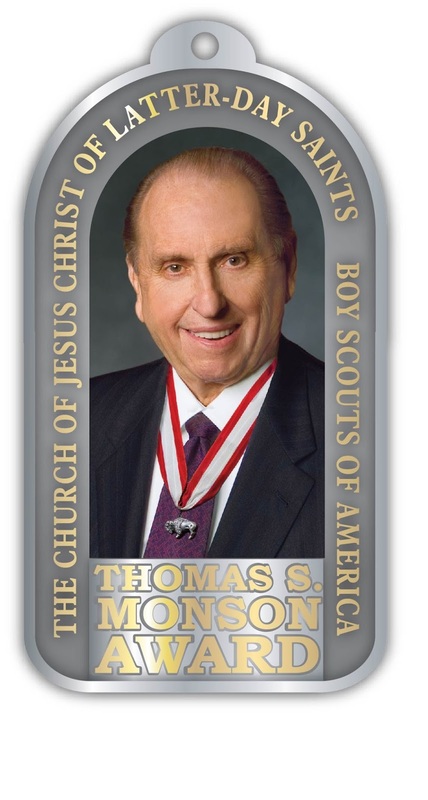 Since Monson has already received nearly every other award scouting offers, including the Silver Beaver, Silver Buffalo, Bronze Wolf, and Silver Fox, it appears the BSA dug deep to find another award to give him. President Monson received multiple, lengthy standing ovations in his honor from the full-capacity Conference Center crowd. During the program, the BSA National President announced that the The Leadership Excellence Complex, located on the 10,000-acre Summit Bechtel Family National Scout Reserve in West Virginia, would be renamed the Thomas S. Monson Leadership Excellence Complex. Excellent! The BSA announced that a new $3 Million, 23,000 square foot lodge in Utah would also be named after Thomas Monson. So, for those keeping score thus far, President Monson's honors in the year following the policy change include two multi-million dollar scout facilities named after Thomas Monson, plus a personal award to him for something he did 74 years ago, a stage production and tribute, and a new award bearing Monson's face offered to all scouts and leaders at the National Jamboree. Not a bad haul for one guy. The BSA certainly has gone out of its way to honor President Monson after the gay-scout policy change went through. But I’m sure it’s all above board, and purely coincidental. Undoubtedly lots of people get this much honor and recognition from the BSA in a single year, even if such people don’t happen to personally hold the future of the BSA in their hands. Nothing to see here. These aren't the honors you're looking for. Move along. The BSA effectively dodged the negative publicity and social pressure brought by homosexual interests, and instead placed it squarely on the churches that sponsor scout units. This, despite the fact that the Supreme Court had already ruled that the BSA was not legally required to allow gay leaders. The BSA gets the “good” press for being “open,” “inclusive,” and “equal” while the churches will bear the negative PR and backlash for supposedly being otherwise. Of course, the gay-interest groups will not rest until all troops drop all restrictions against homosexual participation in all forms. As a BSA PR move, this was masterful. But it certainly bore risks as well. The BSA must hope the positive PR will bring in new sponsors to replace the potential losses they face by alienating religious supporters. Many millions of dollars are at stake. Those are strong words from the organization that has been scouting’s largest supporter for over 100 years. Something has clearly changed, even from two years ago. 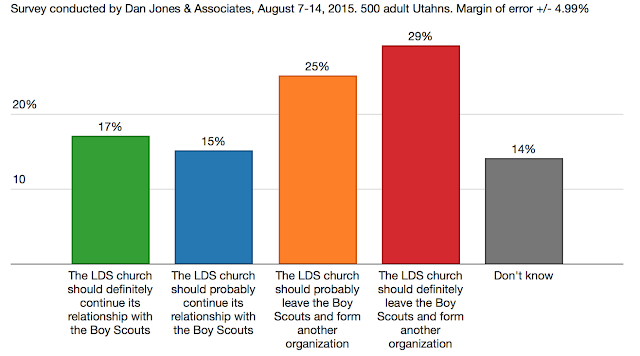 On the heels of the not-so-veiled LDS threat to drop scouting, came a Dan Jones poll showing that 63% of “very active” LDS church members in Utah believe the LDS church “definitely” or “probably” should end its relationship the BSA. If you broaden the criteria to "active" and "very active" the number is still 54%. It’s interesting to note that this poll was professionally done, and published through LDS-church-owned news outlets. Clearly, the LDS church wanted it publicly known that the church members want scouting to go. Who do you suppose paid to have the poll conducted? If the church were being run by common consent, the BSA relationship would end. But the church isn’t run by common consent. Therefore, it really comes down to the decisions of church leadership. 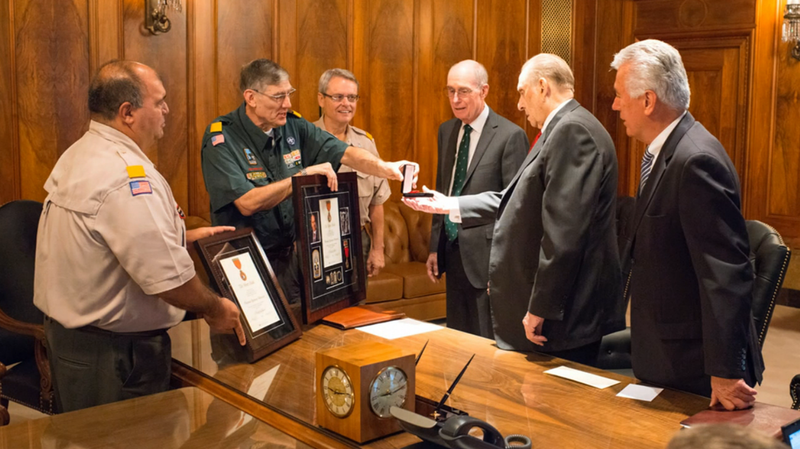 In 2013, President Monson stood with the BSA, and received massive recognition, honors of men, and worldly acclaim from that organization for doing so. Whether you think it was purely innocent or a buy off, it really makes no difference now, as President Monson now suffers from ill health and age-related decline in mental capacity. Public appearances are scarce and his day-to-day leadership capacity is limited. The decision may be out of his hands. The Quorum of the Twelve is also short staffed, with only 9 (possibly fewer) functioning apostles. It will be very interesting to see how this develops, and who it is that actually makes the decision. On the one hand, the LDS church could choose to stay with the BSA, relying on the “religious exemption” to exclude gay leaders. If it does so, the LDS church, as scouting’s largest sponsor, will likely then bear the majority of negative PR and social pressure from gay-interest groups. Having gone down that road before with California's proposition 8, the church is NOT keen to go there again. But then again, dropping the Boy Scouts would also have negative PR consequences for the church, especially if it happens over the gay issue. Either way, it's a very tough decision. Hence, the need for market research and polling to guide the prophets in their prophetic responsibilities. It's the LDS boys who stand to lose the most if the church and the BSA sever ties. LDS boys would lose access to excellent BSA camps, facilities and programs for all sorts of outdoor adventures and training. The boys would then reach parity with LDS girls, who have never had such access. Ahem. If the LDS church does part ways with the BSA, scouting will have to scramble to replace lost income and participation. By becoming more socially relevant and bending to the whims of public opinion, perhaps the BSA will see increased numbers and sponsorship in the future. Perhaps gay organizations will take up the torch and start sponsoring troops. Certainly, someone will have to if the BSA loses LDS sponsorship and money. I’m not going to guess which way it will go. But I am going to watch carefully. If the LDS church stays with scouting, who will get paid off honored this time? And how? Postscript: The day after I posted this, the LDS church announced its intention to stay with scouting. Shortly thereafter, a new Dan Jones poll was commissioned. It showed that among "very active" LDS members, 81% believed the church should stay with scouting. That's a massive swing. In fact that's an absolutely unheard-of swing! To go from 63% against an idea, to 81% in favor of it in less than a month, demonstrates just how powerful LDS leadership is in forming the opinions of active members. Politicians lie, scramble, and agitate just to move a poll a point or two. They would kill for this sort of power over thought. One lesson to learn is that LDS leadership could easily change a wide variety of church policies or teachings, and the active membership would fall in line. This is worth noting and remembering. I did not know about any of these details. Thank you for posting this. Very eye opening. And disturbing. I honestly hope they do sever ties with the BSA. I've been both a scout and a scout leader. I've also spoken with non-LDS leaders scouts in the past. LDS troops tend to have a less-than-stellar reputation in the scouting community. I've seen first hand how awards are handed out without the required work. I've seen the boys coerced into getting their eagle awards by their parents and church leaders. Right now I have a 10-year-old cub scout in my den, who I've seen all of three or four times at our meetings, scrambling to get his Arrow of Light because suddenly its a priority (now that summer sports have ended). I've seen the highest awards all but handed to young men who refuse to lift a finger because they don't see the benefit. I've seen the price tags of scouting books, uniforms, camp fees, awards, etc. Friends of Scouting is a scam. At some point I came to the conclusion that the organization is no longer interested in teaching boys how to be men but simply exists to make money for its leadership. In my opinion the organization can descend into irrelevance and die. Quite the coincidence. I was reading your post (good one by the way) and this email from my ward came through. "The Church of Jesus Christ of Latter-day Saints appreciates the positive contributions Scouting has made over the years to thousands of its young men and boys and to thousands of other youth. As leaders of the Church, we want the Boy Scouts of America (BSA) to succeed in its historic mission to instill leadership skills and high moral standards in youth of all faiths and circumstances, thereby equipping them for greater success in life and valuable service to their country. In the resolution adopted on July 27, 2015, and in subsequent verbal assurances to us, BSA has reiterated that it expects those who sponsor Scouting units (such as the Church) to appoint Scout leaders according to their religious and moral values “in word and deed and who will best inculcate the organization’s values through the Scouting program.” At this time, The Church of Jesus Christ of Latter-day Saints will go forward as a chartering organization of BSA, and as in the past, will appoint Scout leaders and volunteers who uphold and exemplify Church doctrine, values, and standards. With equal concern for the substantial number of youth who live outside the United States and Canada, the Church will continue to evaluate and refine program options that better meet its global needs." The waiting is over Church will remain affiliated with the BSA. Well, I guess the wait is over. LDS-BSA BFF. "The Church of Jesus Christ of Latter-day Saints will go forward as a chartering organization of BSA, and as in the past, will appoint Scout leaders and volunteers who uphold and exemplify Church doctrine, values, and standards." That's why you need a PR department. Not the biggest fan of scouting and I believe the LDS church will eventually cut ties with BSA. It is just a matter of time when lawsuits start popping up and the LDS church will then make an exit. That being said, I don't understand why you care what the LDS church does? I have read many of your posts here and I gotta say... You have a lot of pent up hatred for the LDS church. You try to mask it but anyone who reads your blog can see it as plain as day. I know you are angry that you got ex'd. I would be too if I had the pride that you have. Maybe at one time you were hoping to be called to a position of authority and it never happened. This was probably the first spark as you in your gospel knowledge simply could not understand why you were not chosen. It is easy to see that your lack of humility and your sanctimonious attitude is probably the reason and why you eventually headed down the road which you are still on. As a famous person once said, "Haters gonna hate!" Well, I guess he has so much pride that he allowed your comment to be posted. You see hate, but I see someone who is trying to cut through all the wool that is pulled over everyone's eyes. The truth hurts, and it is not hateful to share it. Adrian has repeatedly asked that others point out any falsehoods that he has posted. I haven't see many take him up on the offer. Anonymous, that's a ludicrous comment. If you only knew Adrian you would not question his character whatsoever. People of integrity expect to be believed, and when they're not, they let time prove them right. Time will prove that the church has made a major mistake on this one. Thanks for revealing yourself 'Anonymous'. Those are some serious projections. I know Adrian well, and I don't see any of your accusations in him. Well, I for one am very, very disappointed. As an active, openly gay male in my Utah County ward, I was counting on the Church bailing on BSA. Being in the Sunday School Presidency, a home teacher, a volunteer Temple worker, Gospel Doctrine substitute teacher, and ward choir director to boot,... well, I was just hoping, that not wresting the BSA from the grip of the Church would assure that I would NEVER have to be called to that program. I've got way too much on my plate for Webelos and such, but guess now word has come down, I might not be exempted after all. Darn it! And for that, you win comment of the year, my friend! 6. Do you affiliate with any group or individual whose teachings or practices are contrary to or oppose those accepted by The Church of Jesus Christ of Latter-day Saints, or do you sympathize with the precepts of any such group or individual? So, if I am called as the Scoutmaster in my Ward, do I have to turn in my Temple Recommend? Seems to me, I would have to turn it in, or are all the biblical injunction against homosexual activities simply a series of those pernicious "translation errors" we have been warned about? I recall sitting in church one day a couple months back wondering why I couldn't feel anything, there was no light & truth. I felt empty inside as I sat through the Sacrament & as I listened to the speakers. I pleaded to feel something, anything. I even began reading through the scriptures to find an answer as to why I felt so empty. A sudden thought came to me "I have withdrawn my Hand from the church". It startled me and I was left to cry and sorrow for what was happening. What is happening now with The Church of Jesus Christ of Latter-day Saints is sign of the Lord's words to me that He has withdrawn His hand. There is no more inspiration by the leadership especially since April 2014. They are falling fast. So it does not surprise me that the church has made this decision regarding the BSA. And whatever decisions they will make will not be by the direction of the Lord, it is no wonder who it is that now is directing the church if it is not God. There are only two churches. Another poster who comments here has a blog and mentioned in 2013 when the decision was made something interesting. He said gay scouts were always allowed into the boy scouts. Kind of like the "don't ask, don't tell" policy. Just don't talk about it. Well, for the BSA to come out and make a policy change was very significant especially when closeted gays could be involved with scouting. Ultimately we can now see what they were preparing to do. My question is this though Adrian, was President Monson included in these discussions as a board member? My personal opinion is that the decision by the BSA wasn't a surprise at all and put simply the Church was lying about the decision being done without knowledge of the Church.